Al Goldis | The Associated PressFrank “Muddy” Waters is shown Aug. 4, 2000, in his Meridian Township home. 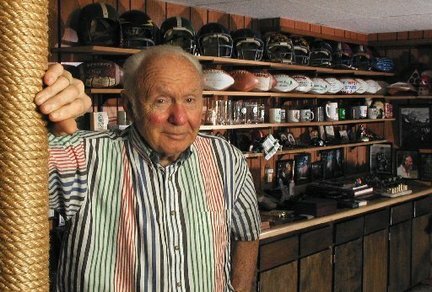 Behind him is football memorabilia, including his collection of game balls and his and his sons’ high school and college football helmets. Waters, who died in 2006 at the age of 83, is a member of this year’s class of inductees into the Saginaw County Sports Hall of Fame. Frank “Muddy” Waters was late to his interview to be the first head football coach at Saginaw Valley State College back in 1974. Already a Hall of Fame coach after building a national powerhouse at Hillsdale College with a 138-46-5 record, Waters left the college where the field was named after him for the chance to build his own program from the ground up. The only problem was he couldn’t find the school to do it. “He said when he took the job that all that was out there were a couple of buildings in a cornfield,” said son Frank “Murky” Waters, who spent 10 years as an assistant coach with his father, including all six seasons at SVSU. Waters, a Chico, Calif., native, changed all that in a tenure at SVSU that spanned from 1974 to 1979. With 200 students staying on a campus with dormitories built to house around 500, Waters convinced kids to play for him in the middle of a cornfield. Before he left to become coach at Michigan State University, Waters helped deliver SVSU the Great Lakes Intercollegiate Athletic Conference title in 1979. For his contribution to building a SVSU program that is now recognized as a top tier NCAA Division II football program — the Cardinals currently are ranked No. 3 in the regional playoff rankings — Waters is among nine inductees into this year’s class for the Saginaw County Sports Hall of Fame. The group will be honored Nov. 8 at Horizons Conference Center. The induction will be the fifth for Muddy Waters, who died in 2006 at the age of 83. He was inducted into the College Football Hall of Fame in 2000, along with the Michigan Sports HOF, the Hillsdale College Athletic HOF and the National Association of Intercollegiate Athletics HOF. The one-time president of the NAIA Football Coaches Association, Waters was named Michigan Coach of the Year eight times. After playing at Michigan State as a running back — he earned the nickname after carrying the ball for a then school record 40 times — he coached high school ball at Walled Lake and Albion. At Hillsdale, his team won a Division II record 34 games in a row, earning trips to the playoffs twice, including a trip to the 1957 Holiday Bowl.